I'ES IN THE UNITED STATES. .GEOGRAPHIC SECTIONS NUMBER OF FACTORIES PRICE PER CWT. SECTION . (P CASE OF (PER CASE OF BULK PER CWT. CASE EARLY IN JULY, ACCORDING TO THE U.S. THE CURRENT SUPPLY AND DEMAND SITUATION. GENERALLY SATISFACTORY IN TRADE CIRCLES. FROM THE JULY PRICE OF 3 CENTS PER OWT. APPROXIMATELY 9B% OF THE.TOTAL FACTORIES IN THE UNITED STATES. 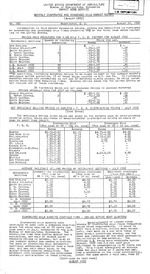 TOTAL STOCKS ON AUGUST I, 1932 225;'896,999 LBs. 21,446,986 LBS. 12,581,558 LBs. AUGUST I, 1932 225,396,999 LBS. 21,446,986 LBS. 12,581,558 LBS. JULY 1932 212,430,726 LBS. 19,986,111 Les. 13,799,688 LBS. AUGUST 1, 1932 225,896,999 LBS. 21,446,986 LBS. 12,137,795 LBS. AUGUST I, 1931 274,636,112 Las. 24,070,653 LBS. 16,019,659 Las. JULY, 1932 144,802,902 LBS.' 5,236,111 Las. 7,813,524 LBS. JUNE, 1932 173,171,660 LaB. 5,091,990 LBS. 11,888,121 Las. JULY, 1932 143,990,922 LBS. 5,236,111 LBS. 7,458,188.Les. JULY, 1931 1.21,767,473 LaB. 7,993,346 Les. 9,791,835 Las. TOTAL STOCKS ON JULY 1,1932 212,430,726 LBS. 19,986,111 LBS. 13,856,121 Las. ESTIMATED PRODUCTIONJULY, 1932 153,875,545 LBs. 5,314,504 LBS. 11,377,411 LsS. CENTS IN JULY TO 23 CENTS IN AUGUST. MAKE IS NOT EXCEEDING THE 5-YEAR AVERAGE. CENT ON JULY I TO 6.6-PER-CENT ON AUGUSTI. DUCTION OF 40 CENTS PER CASE .ON MAY 14. FAIR AS REQUIREMENTS FOR ICE CREAM LAG. ON JULY I UNDER A YEAR AGO.